A quick PSA to remind you that it's fiddlehead season. 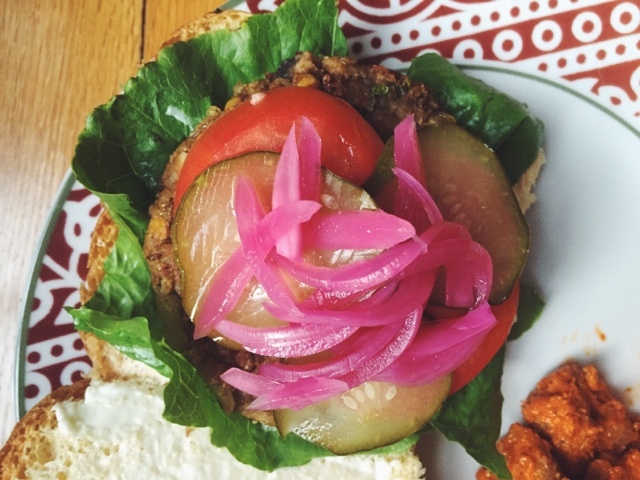 So go forage them or, if you're lucky, your local co-op or farmers' market might have some. 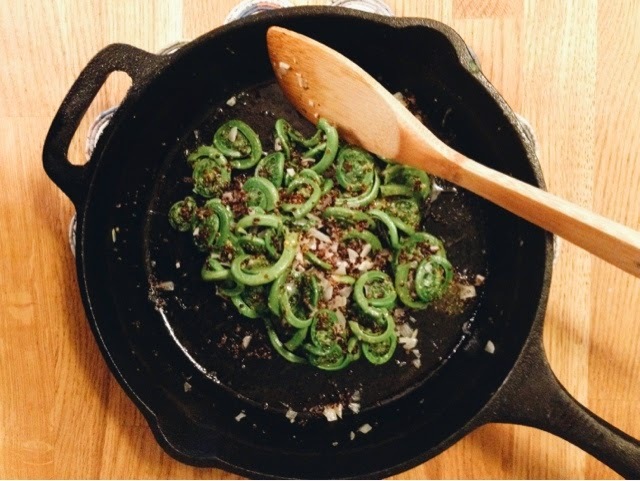 I had a WEEK at work and yesterday we treated ourselves to a cast-iron skillet full of buttery fiddleheads and shallots. And then a fancy dinner out and a few glasses of rosé for me. But really, the fiddleheads started the whole celebration off on the right path. This website calls fiddleheads "the succulent stalks of spring". Are you intrigued now? There's also a dynamite microbrewery in Vermont named after these foraged ferns plus one of my favorite pieces of artwork is of fiddleheads, painted by the talented Susan Hartley Himmel, also known as my mom. So go find some fiddleheads before it's too late! As I patiently waited last night for trick-or-treaters to ring our doorbell, I set out to make a nice autumnal soup. We were greeted by only a handful of older kids, barely dressed in costume, so I had plenty of time to putz around with some crazy veggies. We came across another CSA box this week and if you know CSAs, you know that you can get some funky produce this time of year. Kohlrabi, I'm looking at you. Celeriac, yep, you are a weirdo. I riffed off of a recipe from the fabulous Love Soup by Anna Thomas. Her undoubtedly delicious recipe called for kabocha squash and turnips. I had acorn squash and carrots, so I swapped those out. To make a great soup, you should buy her book. To follow my adaptation, slice an acorn squash in half, scoop out the crap and then roast it on an oiled baking sheet at 400 degrees for about 50 minutes alongside with three peeled and chopped carrots and a peeled and chopped celery root (celeriac). Meanwhile, sauté up a chopped yellow onion with a pinch of salt and rosemary in your big soup pot. Add in the roasted veg, a thinly sliced leek or two and a combo of vegetable broth and water to equal 4-6 cups. Two tablespoons of lemon juice, three spoons of maple syrup and a touch of cayenne rounds it out for a nice 20 minute simmer. Your immersion blender and a quick taste test finishes the job! For years we lived on a street just a few blocks away, and no one came to our building to trick or treat. Now we live in what we thought was the epicenter of Halloween festivities-- walkable, well-lit, populated with families, well-decorated stoops and front doors-- and still, hardly any trick or treaters. The weather wasn't great, so I'll blame it on that. Meanwhile, I enjoyed this soup with a festive pumpkin pie martini and a crusty French baguette. Yum, frozen vegetable scraps! Click over to my post today on From Scratch Club for an easy kitchen tip for making your own vegetable stock from a stockpile of frozen scraps you collect throughout the week. I've included my standby basic veggie stock recipe too, a must for your Sunday Soup traditions. Head over here to read more!